Body Heat Pads comes in 4 different models. The Body Heat Pads provides pain relief from aches and pains from affected areas of your body easily and effectively for up to 15 hours. Body Heat Pads Joint Heat Wraps is designed for extended comfort which allows you to be active for extended periods of body movement. 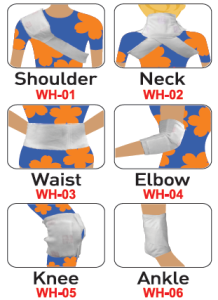 The Joint Heat Wrap tightens firmly and securely to any shoulder, neck, waist, elbow, ankle and knee. Body Heat Pads, Body and Sleep Warmers prevent blood vessel shrinkage cause by cold temperatures and allow the body’s blood vessels to expand and circulate better throughout the body. The Body Heat Pads removes the household need of costly electric heaters, use if dangerous scolding hot water bottles or over exposure to freezing temperatures inside or outside. Apply to any part of the body. Apply the band wrap supporter to your shoulder, neck, waist, elbow, ankle and knee. The Joint Heat Wrap is designed to make it more effective for the heat pads to transfer heat into your body. 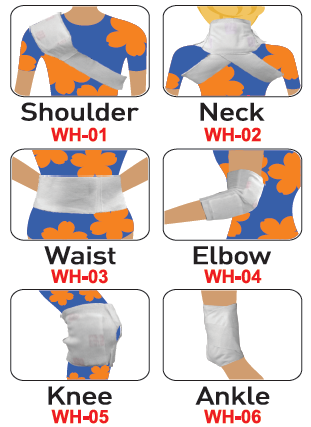 Body Heat Pads provides 15 hours of effective pain relief. Medically proven, affordable and easy to use the Body Heat Pads can be a great gift for your loved ones whom suffer from muscle and joint pain or those who want to enjoy outdoor activity and for anyone who has to work in the cold . This is the perfect item for you. Start living a more enjoyable life today.